This photograph received a Junebug Weddings Best of the Best 2013 Honorable Mention under Wedding Portraits. 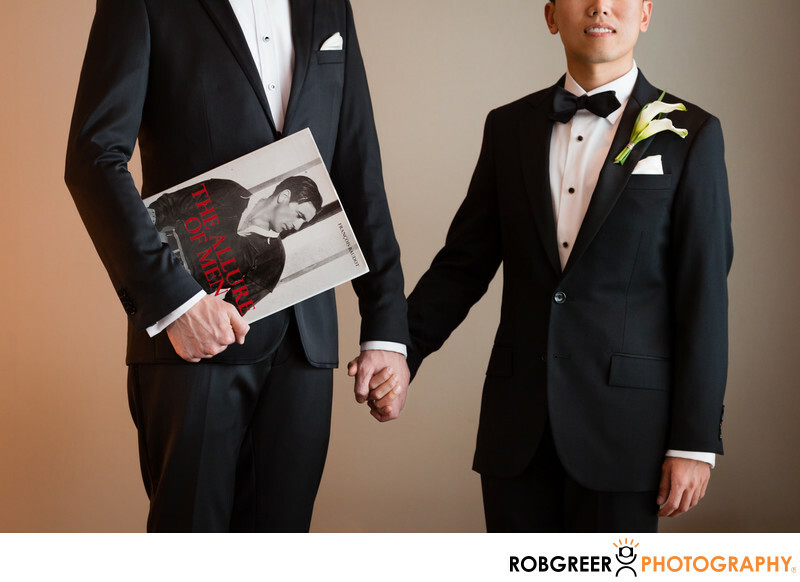 It was also entered in the 2014 Wedding and Portrait Photographers International (WPPI) 16x20 Print, Album, and Filmmaking Annual Competition in the Wedding Details category under the title, "The Allure of Men." Unfortunately, this print received a disappointing score of 76 which indicates an "average professional skill and technique." Although this photograph wasn't terribly difficult to create, I believe that the storytelling and impact of this image is strong. I also feel that the lighting is pretty incredible. As I wasn't in the judging room at the time, I'm not sure why this image didn't resonate with the judges. This image was made in a hotel room in the SLS Hotel of Beverly Hills. As the guys were getting ready, I was walking around the room and I spied the book, The Allure of Men sitting on an end table and I formed my idea. I never even had time to look through this book on the wedding day, but after a quick search, I discovered the following description on Amazon.com: "A collection of the most desired, envied, and debonair men in history. From the frock coats of Gainsborough's portraits to city workers' two-piece suits, men and their fashion have made a vital contribution to our collective notion of style. One of France's leading fashion and style specialists, author François Baudot juxtaposes paintings and photographs of famous and lesser-known figures dating back almost 200 years, embodying centuries of elegance and style." SLS Hotel at Beverly Hills is located in Los Angeles, California. Phone: (310) 247-0400. Website: http://slshotels.com/beverlyhills/. 1/80; f/3.5; ISO 640; 98.0 mm.